You have to pay more for the packaged drinking water supplied by the Railways in trains and platforms. 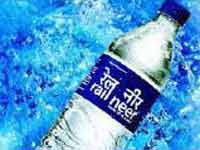 Railway Ministry has given the clearance to a proposal to increase the rate of packaged drinking water Rail Neer from Rs 12 to Rs 15 per one litre bottle. The price of the 500 ml bottle will be increased from Rs 8 to Rs 10, as per the decision. "IRCTC, which manufactures and supplies the packaged drinking water in rail premises, had sought the ministry's approval for revising the rate of Rail Neer and we have given the approval for the same," said a senior Railway Ministry official. Now, it is upto the IRCTC to finalise a date for implementation of the new rate, the official said. IRCTC, a subsidiary under Railway Ministry, is currently manufacturing Rail Neer at three locations - Nangloi (Delhi), Danapur (Bihar) and Palur (near Chennai) with a cumulative production capacity of 3.80 lakh bottles (1 litre capacity) per day.